The Marion Chamber of Commerce will award two scholarships for the 2018-2019 school year: $1,500 Grad Spree Scholarship and a John A. Logan College Two Year Tuition Waiver. 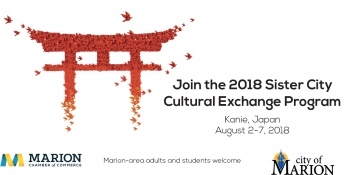 The City of Marion in partnership with the Marion Chamber of Commerce will be selecting adults and students to participate in a weeklong trip to Kanie, Japan, August 2 - 7. The estimated cost of the trip will be approximately $2,000 for airfare plus spending money for students and $2,500 for airfare, hotel and spending money for adults. Application deadline is March 1, 2018. Should you need additional time for getting your application submitted, please contact Jared Garrison at (618) 993-2657 or Jared@ThePavilionEvents.com. Application should include a $250 deposit toward travel expenses. 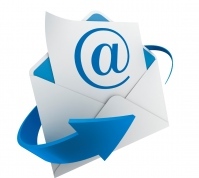 Your deposit of $250 is tax exempt and is non-refundable. Please make checks payable to the Marion Chamber of Commerce Foundation. An informational meeting is set for March 5 at 5:30 p.m. at The Pavilion. Please RSVP through The Pavilion. The Marion Chamber of Commerce Monthly Membership Luncheon will be held on Tuesday, February 13 at noon at Celebrations Event Center (click for directions). The speaker will be then Mayor Anthony Rinella. St. Nicholas Brewing Company will be the caterer. The menu will include chicken salad sandwich and vegetarian lasagna. 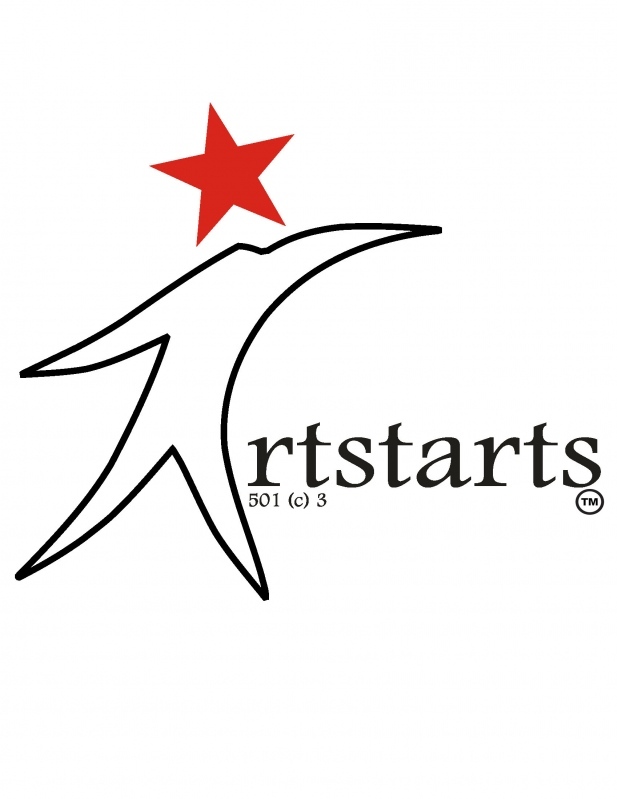 Artstarts is the sponsor of the February Monthly Membership Luncheon. Registration for the event is $12 (payable to the Marion Chamber of Commerce) to those who RSVP prior to noon on the Monday before the luncheon. Pre-registration is strongly encouraged. After noon on the Monday before the luncheon, no more registrations will be taken, however walk-ins will be accepted. Please note that the walk-in rate is $15. 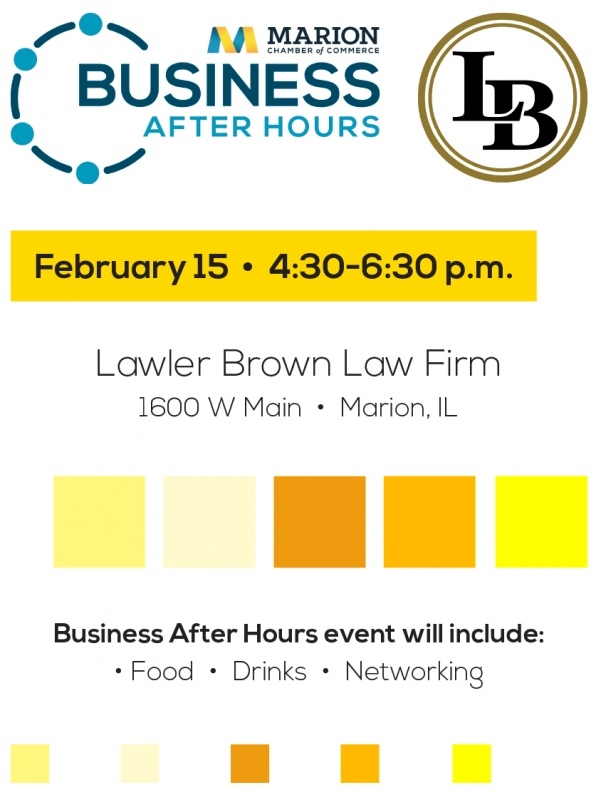 A Business After Hours program will be held at Lawler Brown Law Firm, 1600 West Main, on February 15 from 4:30-6:30 p.m. 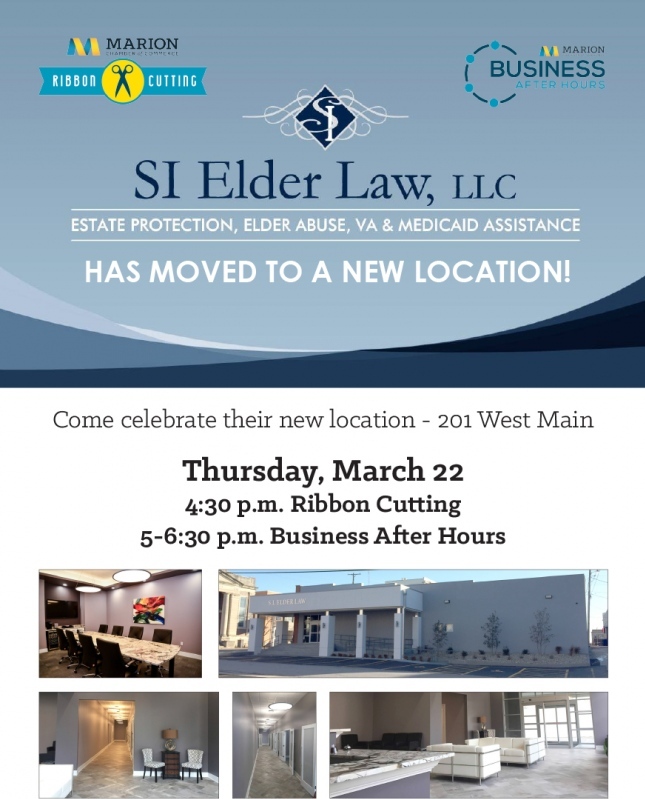 The event will include food, drinks and networking. Every quarter the Marion Chamber of Commerce Membership Committee holds a New Member Quarterly Luncheon. This quarter’s New Member Quarterly Luncheon will be held at noon at Union Street Pub on Tuesday, February 20. 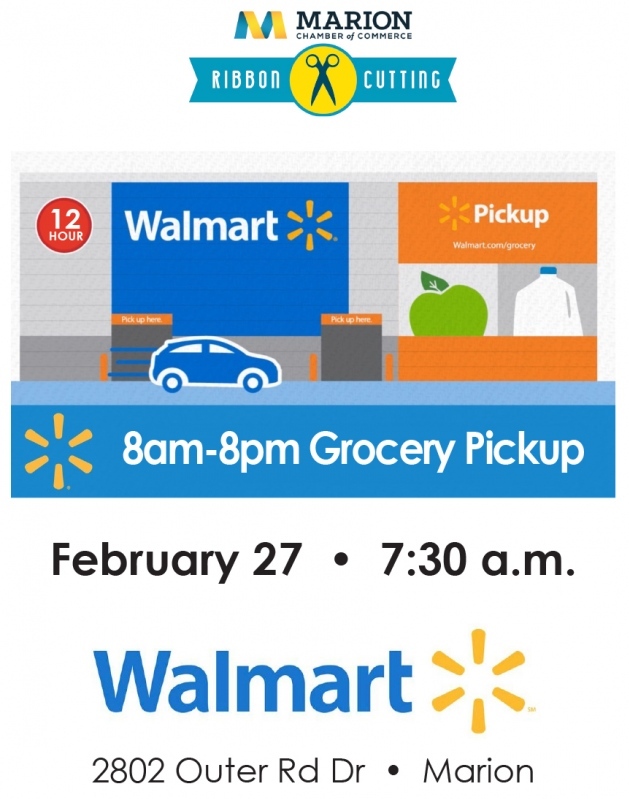 A Ribbon Cutting Ceremony will be held on February 27 at 7:30 a.m. for Walmart's grocery pickup service. The February Lunch & Learn will be held on February 28 from noon - 1 p.m. at Heartland Regional Medical Center, Classroom 1. The topic will be "Thinking for Success with Dr. Jamie Clark Verbeck." 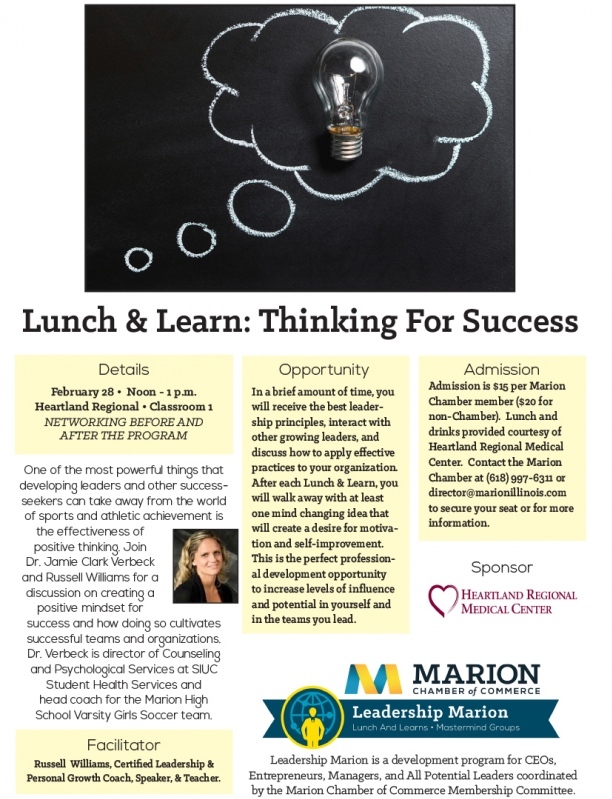 The February Lunch & Learn will be presented by Dr. Jamie Clark Verbeck. One of the most powerful things that developing leaders and other success-seekers can take away from the world of sports and athletic achievement is the effectiveness of positive thinking. Join Dr. Jamie Clark Verbeck and Russell Williams for a discussion on creating a positive mindset for success and how doing so cultivates successful teams and organizations. Dr. Verbeck is director of Counseling and Psychological Services at SIUC Student Health Services and head coach for the Marion High School Varsity Girls Soccer team.